Wherever your heart is... we welcome you to our community and sanctuary to find peace and joy in the light of God's love. Join us for fellowship, prayer and to find a peaceful heart. 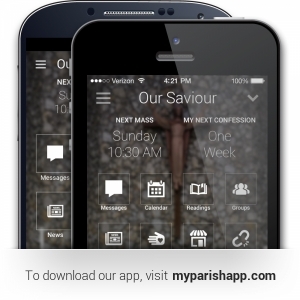 Download our Parish App Today! Our new Church of Our Saviour app is now available to download for iPhone and Android smart phones. Stay connected with our parish throughout the week with instant notifications, an easy-to-access event calendar, and the ability to quickly reply to or share messages via Facebook or Twitter. Also enjoy a bunch of additional features like prayers, daily readings, helpful reminders to silence your phone before Mass or Confession, and much more.